N64 Super Mario 64 (USA) in 16:26.77 by spezzafer. Ever wonder if Mario was actually a ninja wearing blue overalls? Now you know. This run completes the game after collecting a mere 16 stars. 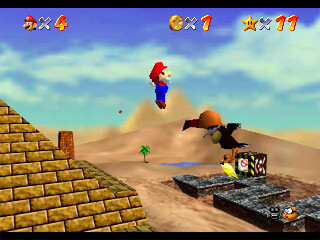 It was originally intended that the player collect a minimum of 70 to finish, but a few bugs allow Mario to pass through doors and barriers that require a minimum number of stars to open. Mario has a very wide range of skills for mobility and some of the physics of this game are easily abused by an experienced player.